Freeport’s Outlets and Shops – Something for Everyone! 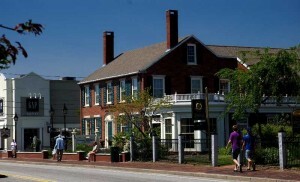 Many people are aware that Freeport Maine is the home of outdoor retail giant L.L. Bean, and still others are aware that Freeport can be said to have been something of a town filled with shops and outlets. However, neither of these statements adequately conveys what a delightful and special place Freeport is. For those of us who live in Freeport, it is easy to forget that so many people (even throughout the New England region, let alone the rest of the USA or worldwide) have never heard of Freeport or L.L. Bean. Because of that, instead of writing, as we often do, about things to do in or near Freeport other than shopping (including our recent article for the Maine Innkeepers Association blog), this time we wanted to provide more information on the five L.L. Bean stores, and the other shops and outlets in Freeport. Following Freeport’s time as a shipbuilding town, it became a shoe manufacturing town. Later, young Leon Leonwood Bean started a mail-order catalog featuring his Maine hunting shoe. That small family business has grown into a huge enterprise, with 5 stores in Freeport (four of which are open 24 hours a day, seven days a week – only the L.L. Bean Outlet closes at night and on Christmas Day). Eventually, Freeport reinvented itself as an outlet town (before America had outlet malls in almost every city). 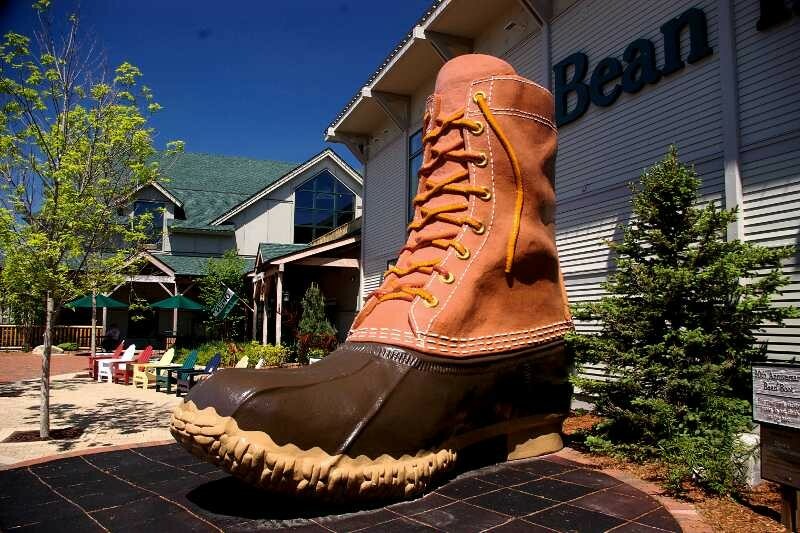 As outlet malls became more common, Freeport changed again, into an unusual mix of outlets and retail, with many local Maine-owned stores, interesting retail shops. In addition to the five L.L. Bean stores (the flagship store, the Hunting and Fishing Store, the Home Store, the Bike, Boat and Ski Store, and the L.L. Bean Outlet), Freeport is home to many other shops and restaurants. In fact, it feels a bit like living in a huge, outdoor, shopping mall. Many of the shops are members of Freeport USA, Freeport’s marketing organization, and therefore are included on the Freeport USA map. Many others, however, are not included on the map, yet do a thriving business in Freeport. 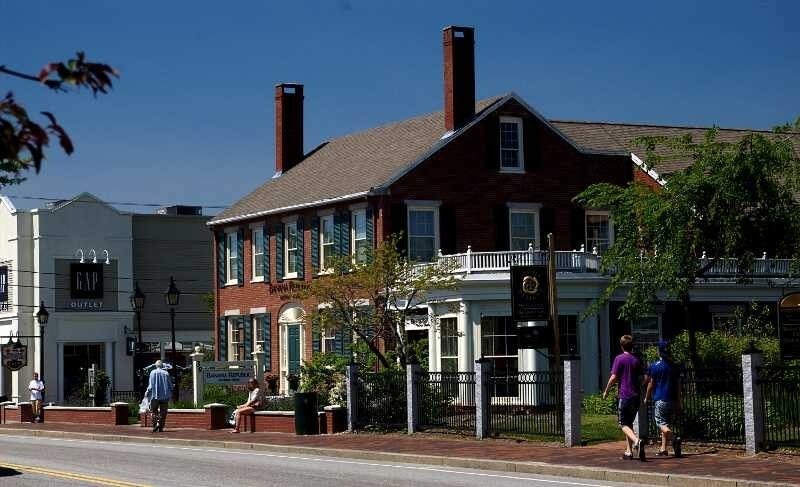 According to Freeport USA there are well over 140 shops and restaurants in Freeport. They range from L.L. Bean’s five stores to small shops like Isabella’s Sticky Buns. There are well-known clothing and shoe stores, like Talbots, Jones of New York, Banana Republic, Polo, and J. Crew, Clark, Bass, Nike and 9 West. There are specialty shops like Georgetown Pottery, Cuddledown, Freeport Knife & Kitchenware, The Mangy Moose, and Cool As A Moose. You’ll find fine jewelry, like R.D. Allen or Brown Goldsmiths, and crafts such as the Beadin Path. From the Pet Pantry to the Coach Factory Store, there is something in Freeport for every member of the household. Let’s not forget the many restaurant, specialty food and candy shops, and more. There’s Wilbur’s of Maine for local chocolate, When Pigs Fly bakery, and Wicked Whoopies for a whoopie pie. There is coffee and tea from Starbucks to Coffee By Design to Jacqueline’s Tea Room, serving a formal tea, as well as selling teas. Restaurants include Azure Cafe, Jameson Tavern, the Broad Arrow Tavern, the Maine Dining Room, the Mediterranean Grill, and more. You’ll find lighter fare at Corsican, or just stop in for a cup of chowder at the Freeport Chowder House or Linda Bean’s Maine Kitchen and Topside Tavern. These are just a few of the wonderful shops and restaurants you’ll find when you visit Freeport. Don’t just allow a couple of hours to walk through the shops. First time visitors often tell us they had no idea there was so much here! Plan at least a day, just to walk through all the stores.